Hi there. 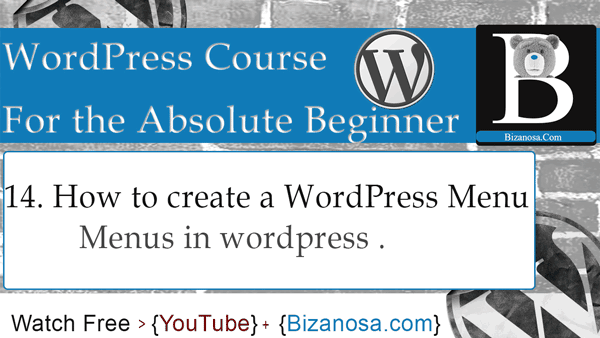 And Welcome back to this WordPress course by Bizanosa.com. This is where we stopped in the last video. In this video we are going to look at menus, so that you can create a navigation. For your website. So, to create menus, we’ll go into appearance, then go into menus. Here is the menus page. As you can see we don’t have any Menu. You can create a Menu by clicking this. Actually if you click this it will just take you here . So, let’s just create a menu here. We’ll call this , main menu. Come here and click on Create Menu. And just like that you have a menu. If I come into manage locations. You can see that this theme supports two menus. This comes different with different themes. This supports two menus so you can have a social links menu .We’ll explore that later and see what it’s about. Actually this is my first time using this theme so I would love to explore what this does and where these links are located. So, I will select my main menu to be the Primary Menu .And I use main menu. And Save Changes. Then I’ll go back into edit Menus. And I will select all the pages. Add them to Menu. Then I will Save Menu. And just with that, if I go back to the website. You will see that our menu comes here. So, this is how the theme is designed. The Menu comes here. Other themes you will see the Menu is here, so it’s all about the design of the theme. So that’s it for this video. You’ve seen how you can create a menu in WordPress. So if this was any other theme you’ll do the same thing and the Menu would appear in the location where the theme was designed to have the menu. In the next video, we’ll continue working with Menus, and see what else we can do with Menus. See you in that next WordPress menus video.